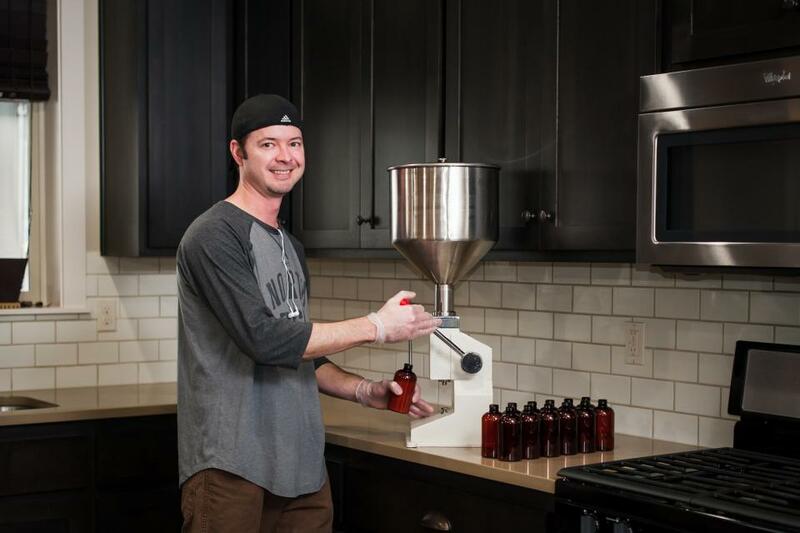 A loan of $6,000 helped purchase a pneumatic lotion filling machine, boost production output, fulfill customer demand, and allows us to spend more time with our two young children. As a child I have always felt a strong connection with nature. My jungle gym consisted of boulders, trees, and cliffs and my sand box was an endless desert. I felt a true connection when I was in the elements. To me, there has always been something magical about swimming in a stream and getting mud and sand in between my toes. This was my playground, not hot asphalt or cold steel. Fast forward to 2009, I was visiting a farmers market in Oregon. I bought my first bar of handmade soap. Having recently read an article on the harmful chemicals in commercial soap, I was determined to make better choices for my body and the environment. I continued to purchase handmade soaps from different vendors and was presented with a wide range of results and I had many questions. This began my journey to create a truly natural bar of soap and products that are high quality, free of chemicals, long lasting, and biodegradable. I researched and made many test batches. I had some success and also some failures. Next, I began experimenting with natural colorants, tinctures, additives and scents. Who knew soap making could be so interesting or complex. Since that time I have expanded into handcrafting lotion, lip balm, soy candles and countless other products behind the scenes. Today, our passion for creation and a natural lifestyle has led to high demand for our products. As a result, we often find ourselves running at max capacity ever challenging us to find ways to streamline our processes. The need for hiring inspired members of our community is becoming more evident on a daily basis. I never dreamed my passion would be running a natural skincare business but I can’t deny that I “fell in love” it. It helps an entrepreneur expand his business by automating parts of his production process! Something Green Soap Company was founded in 2010 out of the need for a natural alternative to soap. The synthetic detergents I was currently using were wreaking havoc on my skin leaving it dry, itchy and uncomfortable. Soon after I read an article on the bath and body industry and the harmful chemicals in commercial soap. I was determined to make better choices for my body and the environment. Our love for nature and now natural skincare products, has given us the opportunity to connect with many people who share our ideals and educate many more about a simpler and healthier lifestyle. Today, we are blessed with the challenges of keeping up with consumer demand. Not a bad problem to have, right? We have been running at mass capacity for a bit of time now ever finding ways to streamline and perfect systems to keep up with said demand. In the near future, we forecast for the addition of hiring local employees. We feel that we are at a tipping point and can’t realistically handle all aspects by ourselves alone. We look forward to the opportunity to give back and directly put more money back into our small community. Our family based business, Something Green Soap Company, has been blessed with high demand for our products and we are needing to scale up the production of our lotions to meet that demand. We feel that it is important to keep our lotions handmade and keep operations in-house ensuring the integrity and quality of our products. There is something really special about the handmade aspect of our products and we would like to keep it this way. The purchase of a pneumatically operated bottle filler will more than quadruple our bottle filling output allowing for up to 20 bottles to be filled per minute. Quicker bottling allows us to make larger batch sizes streamlining what is currently a labor intensive process. The use of this filling machine will allow us to serve more customers and spend more precious hours with our 2 young children. The cost is $6,275.00 (excluding shipping) for this American made product.